Start with easy-to-use geography software to make geographical diagrams. Edraw software makes geography diagramming high-efficient and time-saving. 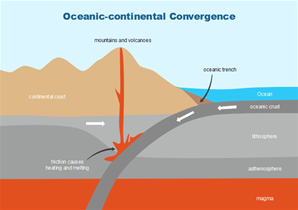 Edraw is not only a professional geo map software, but also an expert in making geography diagrams that can be used in science teaching. 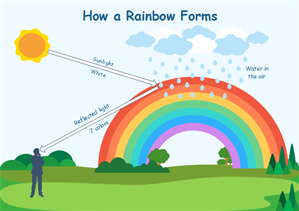 It's universal that almost all teachers make use of science diagrams to teach scientifical and physical facts. With the help of such diagrams, students are able to understand the fact intuitively and acurately. For teachers, using science diagram software can definitely sava then time and improve class quality. 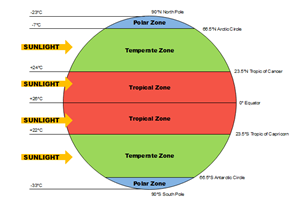 Geography is connected with almost everything that happens around you, such as rainbow, temperature and earth rotation etc. Edraw geography diagram software has no special library of geographical symbols. 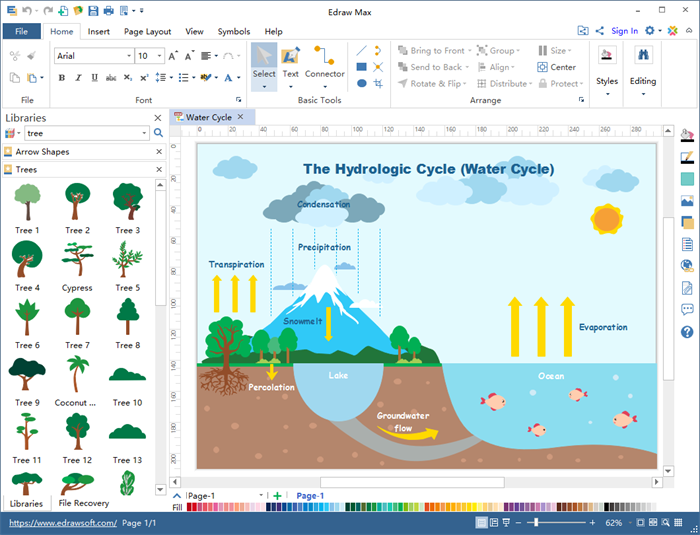 However, it's out of question that you can draw complete geographical diagrams by making flexible use of cliparts from other libraries, such as animals, plants, physics, astronaumy and callout symbols. All the symbols, cliparts and design elements from Edraw are vector-based so that you can customize the color, background and content to fit your style. 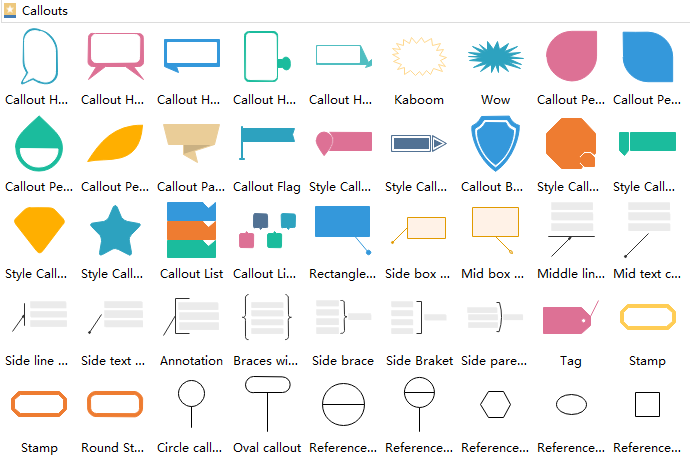 Drawing tools in Symbols tab may meet your demand well. 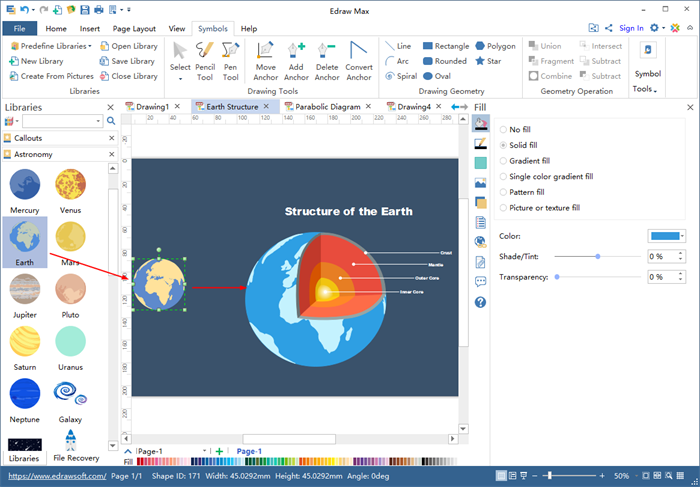 User-friendly user interfaces that is similar to MS Office applications, easy to get started. Handy with predefined symbols and ready-made grographical examples. Convenient to collaborate and share geography diagram (can import SVG images, export SVG, PDF, EPS, PNG). Easy-to-use drawing tools to customize built-in elements for shading, color gradients, and transparency etc. Spending time drawing totally new geography diagram is the real headache. Edraw has provided users with some built-in examples of common geographical facts. If you need them, you may click on the picture to download and customize with Edraw geography diagram software.